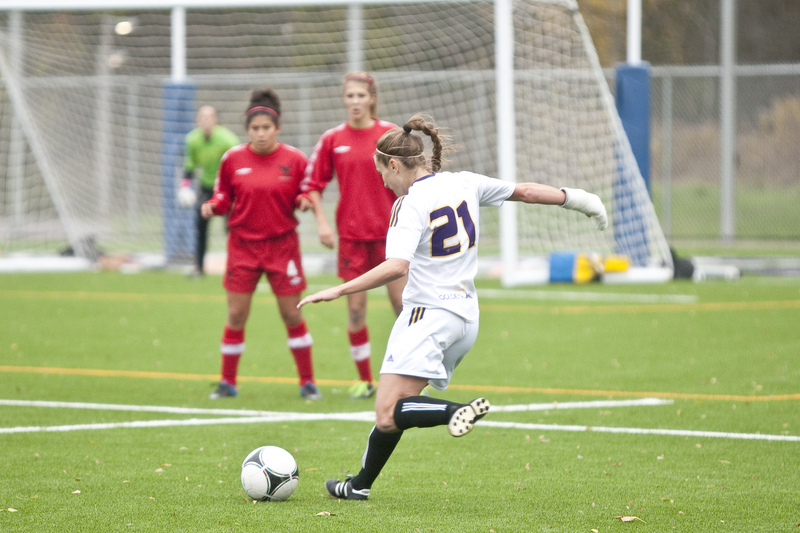 On May 3, Wilfrid Laurier Golden Hawk women’s soccer midfielder Julie Maheu became the only Golden Hawk to have picked up both a goal and an assist during the second annual Ontario University Athletics Women’s Soccer Showcase. Maheu scored on a penalty shot after a mistake from the East team defender to bring the score to 3-2 in the dying minutes of the game. Joined by two of her other teammates, defenders Sarah Farano and Kelsey Tikka, they played hard and gave a solid effort. Despite a 4-2 loss, Maheu said she enjoyed her experience playing with her teammates and the other girls across the OUA. “It was kind of awkward because you normally play against these girls on the normal season, but you were supposed to be on their side,” Maheu said. She is no stranger to stepping up and scoring in important games. Even in the losing effort for Laurier in Nationals last year, Maheu potted one goal on four shots, and it was the only goal in the tournament for the entire team. She was given the opportunity to play in the soccer showcase last year, when head coach Barry McLean extended an invitation to fill in after one of the girls could not play. 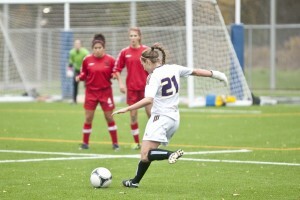 This year was her first time being honoured as part of the OUA all-star first team. “I like to think that I’m a big player and I like to think that I’m a leader on the team, and the fact that other people from the entire league think that I’m one of the top midfielders in the province, that’s amazing,” she said. It came as a surprise to Maheu that the OUA recognized her as being a first team all-star. Earlier in the year, she fractured her hand and was sent straight to the hospital. Her determination to get back to playing soccer demonstrates her character and just how much soccer means to her. “I really wanted to continue to play and that was my issue,” she said of her injury. She remained persistent with the doctors and it paid off. They gave Maheu a removable cast so that she could continue playing with her team. She only missed a total of four games last season before getting back on the field just in time for the playoffs to begin. In such a short season, every game mattered. Laurier went on to win the OUA championship with Maheu, cast on hand. As for the upcoming season, she said she is excited to start playing and for the new rookie class coming into the following 2014 season, which, according to Maheu, is around eight girls. And she’s looking to go further than just winning the OUA championship. Her mind is set on capturing nationals being able to accomplish everything she wanted to during her university career. “I’m expecting to win it all. So … we better win it all,” she said. Thank you so much Drew for the great article!